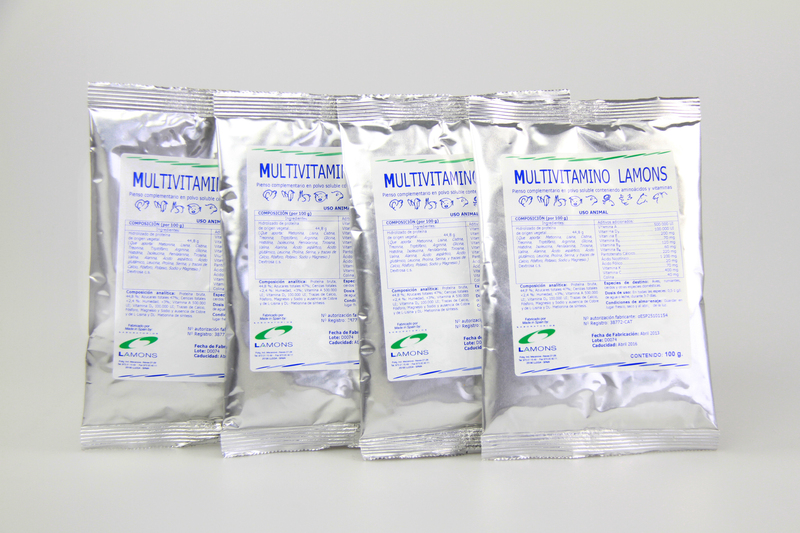 MULTIVITAMINO Lamons is a complementary source of essential amino acids, fat-soluble vitamins and water-soluble vitamins. To improve fertility and farrowing regularity. During lactation, in order to achieve a higher production of proteins in the milk. As a nutritional supplement during the growth phase. In situations of incorrect feeding. During stressful situations (noise, sudden changes in temperature…) and prior to transportation, in order to provide bioactive ingredients capable of stimulating the animal’s defence mechanisms. As a supplementary dietary addition, to prevent viral and bacterial infections, diseased states and convalescence, reinforcing the animal’s natural immunity. Vitamins and Pro-vitamins: Vitamin A, Vitamin D3, Vitamin E, Vitamin B1, Vitamin B2, Vitamin B6, Pantothenic acid, Nicotinic acid, Folic acid, Vitamin K, Vitamin C, Biotin, Choline. Mix at a ratio of 0,5 g/Litre of drinking water or milk, during 3-7 days. Alternatively, use a ratio of 0,5 g/Kg LW per day, mixed in the feed. OVERDOSE, CONTRAINDICATIONS AND ADVERSE EFFECTS: Not reported.